International Journal of Research in Health Sciences,2014,2,1,224-228. 1Associate Professor, 2Post Graduate, Department of Anatomy. Shivamogga Institute of Medical Sciences, Shimoga. Karnataka, INDIA. Foramina transversaria are located on the transverse process of cervical vertebrae. These foramina are known to exhibit variations with regard to size, shape and may even absent, incomplete or duplicated. 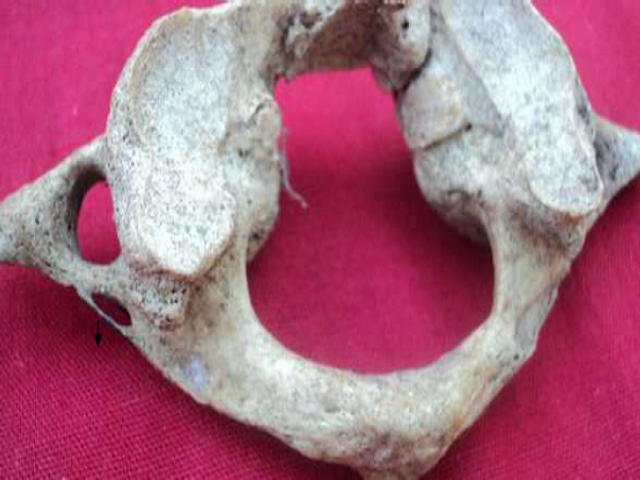 The aim of this study is to investigate the shape, size and variations of foramina transeversaria of the human atlas vertebrae and to point out the importance of these variations. 153 atlas vertebrae of south Indian origin were studied for the presence of various shapes and size. 5 shapes are noted. Type 4 was predominant on right side, type 2 and 5 are predominant on the left side. Double foramina found in 10, incomplete foramina in 6 and accessory incomplete foramina are seen in 10. Variations between the area of right and left side of transverse foramina not much significant, but data provided in this study can be helpful in interpretation of radiographic pictures or in computerized axial tomography and angiograms. The recognition of these variations provides accurate and safety for the posterior surgical approaches of the cervical spine.